Browse : Home SEO It’s Time To Change Your SEO Agency – When Is It The Right Time? It’s Time To Change Your SEO Agency – When Is It The Right Time? With the prevalent rat race in the world of SEO, everyone wants to acquire the highest search engine rank. As Google is king of all search engines, all the websites’ dream is to be fitted within the first page of Google’s search engine result. But what is the secret behind getting placed in the first page of Google’s search engine result? It is effective SEO or rather search engine optimization. SEO has become the most popular word nowadays as every webmaster who owns a website is looking for some of the best SEO techniques through which he can obtain the highest rank in the search engines and boost their visibility and traffic at the same time. If you’ve hired an SEO agency for help and you’re not receiving any positive result, it’s time for change. 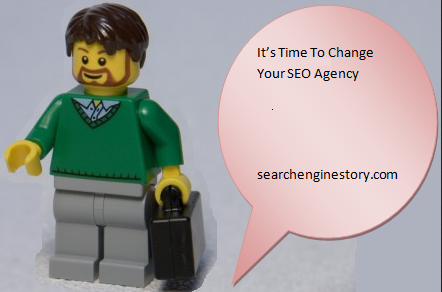 When do you know that it’s finally time to change your SEO agency? Here are some instances that you may take into account. 1. They might not be updated with the best practices: SEO is an industry that keeps on changing very often and therefore whichever SEO agency you choose should be updated with the latest strategies and techniques in order to give the best results to their clients. From time to time, you will come across a company that isn’t updated with the best practices in the industry. May be they are still indulging in keyword stuffing on page optimizations and also building links from blog networks. Not only will these aforementioned mistakes hurt your search engine results but may even penalize your website in the near future. If all this is happening with your SEO agency, you can be sure that it’s time to change the SEO agency. 2. They don’t have enough man power: Another big reason behind the agencies not getting it done for their clients is due to lack of man power. All leaders in the online marketing companies can acknowledge this that one of the toughest things to do within an agency is to determine the capacity and know when it is the right time to hire. Due to this, the clients are most often not getting enough work for what they’ve paid and when this happens, the search engine results suffer. When you see that your SEO agency lacks manpower, you can decide about hiring a new one. 3. Too much outsourcing: Nowadays, the SEO agencies are looking for smarter ways of getting more work done without having to hire people. When they do this, they start looking for partners to outsource to some other low wage country to take care of their profits and fulfilment. This might not be entirely wrong but when too much work starts getting outsourced, you start losing control on the quality of the work. This happens almost every time. As a client, you should always ask your agency what they outsource, how much of it is outsourced and to whom. You should be aware of everything as a client. Therefore, when you’re getting help of an SEO agency in order to improve your search engine ranking, you should make sure your agency doesn’t commit any of the above mentioned mistakes.